The club that fights for your right to still party! 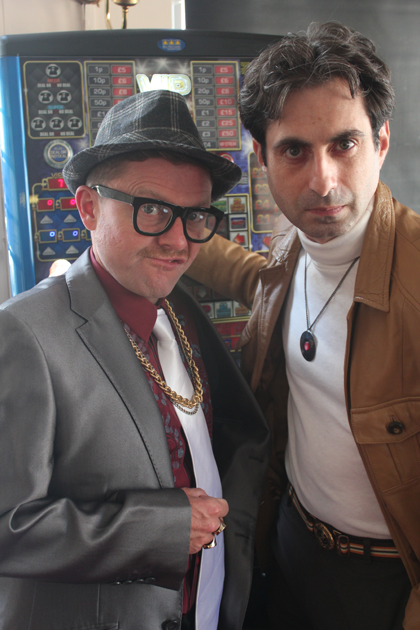 Join Donny and Reggie, part-time market traders and full time party starters (and close friends of Pat Sharp and Pat Butcher) every first Friday of the month at the The Phoenix, W1 from 10.00pm-2.30am at the club for those old enough to know better. No kids are allowed, meaning anyone under the age of 28 will be stopped at the door and forced to go home to listen to the new Justin Bieber album. When you make it past the hallowed portals you can expect to hear the finest: pop, indie, rock, disco, Motown, rock ‘n’ roll, power ballads, soul, punk, ska, northern soul, funk and old skool hip-hop, taking in the 60s, 70s, 80, 90s and a tiny bit of 00s, in fact anything that Donny and Reggie fancy playing to get those aging disco pants going. Donny and Reggie take over from their uncle's Don and Reg and Coffin Dodgers Disco. These boys are quite the men about town. Drinking buddies of Terry Wogan and Gordon the Gopher back in the day and the finest purveyors of nylon knickers this side of Kingston. Donny was down to the last two for the Lewis Collins role in the Professionals and Reggie is a regular understudy for Warwick Davis when he can't be bothered to turn up on set. The nearest tube is Oxford Circus. But you can get buses from all over London if you don't like the tube as it's central London and all roads lead to Rome as they say. Have a question then email us, or give us a call on 07806 710236.